Being surrounded by nature helps this introvert recharge. Those are seals recharging on the beach. When I unexpectedly stayed overnight in Marin County, CA, not long ago, I relied heavily on my iPhone. Its mapping software helped me drive to Sebastopol and, the next day, to navigate to Point Reyes National Seashore. Without my car charger, I noticed the phone’s battery drained quickly during the day, similar to what happens to this introvert when I’m overextended, socializing or multitasking for too long. Without resting or pausing or taking time to myself, I can easily run out of steam and become irritable if not dysfunctional. Faced with a rare clear day at the coast and an abundance of photo worthy scenes and textures at Drake’s Beach, I decided to take as many pictures as I wanted with the iPhone. Somehow, I’d find a way to recharge my Apple device so that if I needed to use it in an emergency, I could. As the battery level dwindled with each image I captured, quickly falling to less than 30%, I was reminded of walking El Camino de Santiago when my camera froze with its zoom lens extended. My point and shoot had run out of juice and, I realized later that afternoon, so had I. The combination of anxiety and exhilaration had kept me moving too relentlessly in the preceding days. It took several hours for the camera to recharge enough for the lens to retract while I, impatiently checking it every 20 minutes, attempted to rest. Perhaps if my body came with an energy level indicator, much like the iPhone’s, I could more easily monitor when to stop, pause or simply do less or move more slowly. Rather than rant about the iPhone’s battery life, that memory encouraged me to check in with myself and discover that, as much as I would have loved to continue to walk barefoot along the damp cool sand and watch seagulls catch crabs, I needed a break. I went into the gift shop, bought a green tea, and asked the woman attending the store if there was an outlet I could use. She pointed to one outside, on a wall near the entrance to the public restrooms. I walked to my car, retrieved the phone’s regular charger from my backpack, and returned to the facilities area to plug it in. “Is this yours?” said the employee, emerging from the shop. She held up a yellow iPhone in a familiar plastic case. As the iPhone recharged, I sat on a nearby bench, sipped my tea and snacked on salmon jerky and a Cara Cara orange from a farmer’s market, an impromptu and late lunch. It was after 4pm, and I had vaguely planned to return to the city around that time. But having rested and restored my phone’s battery to 75%, I decided to continue exploring the area and soak up the unusually glorious day. Perhaps, as a bonus, I’d avoid traffic into the city by lingering. I drove towards the lighthouse, parked along the narrow road, and walked down a winding path to an overlook, vaguely reminiscent of Finisterre in Spain. The wind pelted my jacket, loudly snapping the fabric back and forth; I struggled to cinch my hood against it. Waves rushed the shore. With whitecaps dissolving onto the beach, it was as if I was witness to a moving watercolor painting as far up the coast as I could see. If the wind hadn’t been so insistent, I would have stayed simply to absorb the ocean’s powerful rhythm while gazing at the horizon. I returned to my car and, still sensing the pull of the place, as I headed toward the exit I instead turned right onto a road wide enough for one car but not two, which led to Chimney Rock. The narrow stretch of asphalt ended at a small oval parking lot with a pair of restrooms on one edge, a dirt trail beginning nearby. A sign by the trailhead mentioned local floral and fauna but, as far as I could tell, failed to mention the trail length. Curious about what lay ahead, I decided to walk as far as I could. Not too much later, the flat trail gained slightly in elevation, following the top of the cliffs on which it’s perched. 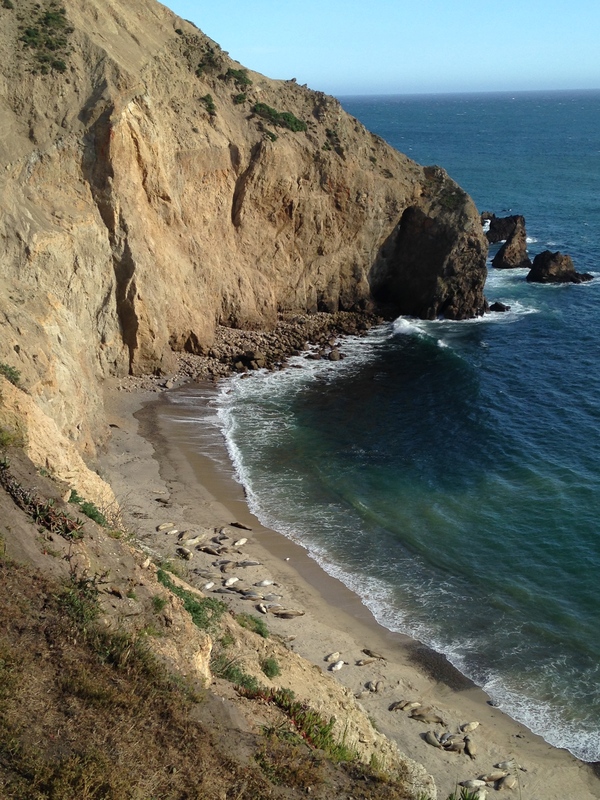 Peering over the edge, I spotted dozens of seals lazing, basking and barking on the beach, perhaps the California equivalent of a herd of elk. As I snapped some pictures, a trio of women came up the trail. I asked how far the path continued. One mentioned it was two miles in a single direction. For some reason that seemed like an overestimate, so I kept going. The packed trail led through a fragile ecosystem, small green plants low to the ground interspersed with bright flowers such as Indian paintbrush, also found in Colorado’s alpine environments. With the ocean on either side of a steep drop, the sun above, a more playful wind pushing and pulling at me, and my feet contacting the ground, it was as if the ridges of the Rockies had been transplanted to sea level. Suddenly, I was back in my element, without having had to ascend thousands of feet. With my battery recharged, not to 100% but certainly more than the previous day, when I had been running low, I reluctantly drove back to San Francisco. « When Adventure Beckons, Pause. Then, Buy a Toothbrush. As I began reading this post, I was reminded of a time I attended a school play at the Denver Waldorf School (Rudolf Steiner). Many of the parents attending the play were disappointed when the teacher announced that cameras were not permitted. Instead, she patted her chest with her hand and encouraged them to take heart pictures. Both you and your iPhone found just what was needed to keep going. You listened to your intuition, which, based on your wonderful descriptions and the well-framed photo, led to an inspiring sight of the coastline and an energizing experience (I doubt your phone could say the same, but hey, you never know). Even if you hadn’t been able to recharge your phone, I suspect you would’ve taken many heart pictures. After all, they’re the ones that live forever. Yes, heart pictures! What a great story. I do vividly recall the one photo I wanted to take on the Camino but couldn’t because my camera had died. I made a point of staring at this castle on a hill until it burned into my brain. And, sometimes, having a camera helps me recall a detail or a moment that I might otherwise lose. The overall feeling of being at Point Reyes, or in other natural settings, can’t be captured in an image, however. hi ilona, recharging on the coast of Point Reyes is something Siri would want for you… What a great metaphor and reminder to check in with ourselves. Ah, Siri…what would we do without her/him/it?